Yesterday I spoke with Jennifer Weishaupt, president of Mid-City Neighborhood Organization, about the possibility of the VA hospital at the site of the old Lindy Boggs Medical Center (Mercy Hospital). As you may be aware, Victory Real Estate Investments has assembled some parcels of land, including the old hospital. They were hoping to build a big retail complex, but because of the downturn in the national economy, that’s looking less likely. So Victory recently offered the land to the Veteran’s Administration. According to Jennifer, the VA has been made aware of the plans for the greenway along the Lafitte Corridor. Indeed, they seem to have an appreciation for the value of it — and it kind of makes sense, doesn’t it, that a public health entity would see the value of a public health infrastructure. 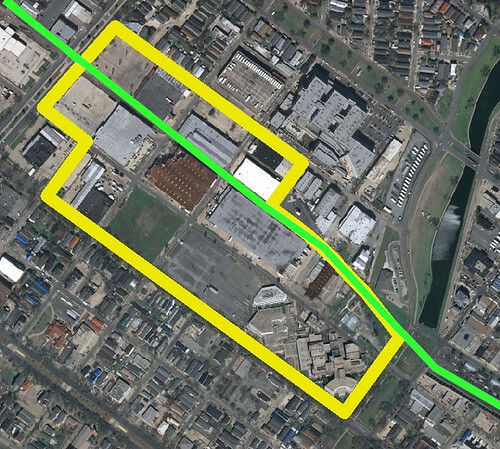 The illustration above shows the proposed alternative VA site (yellow border) and the path of the greenway on the Lafitte Corridor (green line). But moreover, I think the Lindy Boggs site offers some advantages over the current “front runner” location in lower Mid-City. 1) It would entail less destruction/displacement of historic residential homes. 2) Maybe Deutches Haus could stay in place. 3) It’s in line with the Mid-City Plan, as formulated by residents of Mid-City in 2006. It also bears mentioning that the VA hospital would offer better jobs than a retail complex would have. There is a potential downside, in that the VA would no longer be located near the LSU facility. I’d gotten so used to hearing them mentioned together that I had come to think of them as one and the same — but they’re not. That’s why I’m tentative on points one and two above. I’m really not clear on all the details. Mid-City has been characterized in the press (unfairly!) as taking a narrow, oppositional, NIMBY view of the Victory retail plan. The folks at the VA are a bit gun-shy because of that. Therefore I think it’s extra important for residents who support this idea to make their views known. Whatever your perspective, I encourage you to come to the public meeting on this proposal, which is this Monday, August 11, from 7-9 PM at Grace Episcopal (3700 Canal). Update: Here’s an opinion from a friend of mine who’s active in Lower Mid-City and has been much more attentive to the LSU/VA plans than I’ve been. I found his comments informative. I think the site is perfect for the VA. I think LSU can absolutely function independently of the VA and vice versa…and they may actually WANT to. Plus Xavier is a huge fan of decentralizing all the medical talk away from the core downtown (tulane/LSU) area and spreading the concept of the biomedical industry to include the Xavier area etc. The original plans called for LSU/VA to be connected phyiscally, but Galvez street cannot be built on top of and so now the only shared resources would be convenience issues for doctors, residents etc but even so, with the new hospitals, you would not have Tulane/LSU doctors necessarily sharing the medical systems of the VA, but rather there would be set teams at each hospitals who are on service for the VA/training at the VA. I also believe that the VA sees the ease and less complicated nature of the lindsy bogg site since the timeline would be advanced 2 years and the city can save multiple millions of dollars that the city DOESNT have to buy out the neighborhood. Some neighbors have wanted to sell, and they may be bothered, but this number is low and insignificant compared to the number of neighbors who are active and want to stay in the area. Only the investment speculators would have an issue with the new site. I personally feel that the VA needs to be in or near downtown, but it doesnt need to be smack next to the LSU hospital to serve the REGIONAL patient population. People from Baton Rouge wont care if its either location. AND the business/economic interest groups i believe can compromise with this issue and really, as long as the focus of the biomedical industry is IN or NEAR mid-city/downtwon, this will be ok. So in short, i would support this site and i believe Lower Mid-City (Tulane/Gravier) would in the end be supportive of this during the monday meeting, but that is my pulse, there has not been a formal poll conducted from our neighbors. Update: Virginia Blanque has written some notes from the scoping meeting. Hmmm… I think I saw something similar to this a while ago, only with LSU taking the Victory site… where might that have been? Oh, right, one of my previous comments here! Any openings down there for a prognosticator (a level above one who works at a card table in Jackson Square)? The only downside to the VA rather than LSU taking the site is that it still leaves Mid-City residents (who aren’t vets) without a neighborhood hospital. So does that mean Rouse’s and Home Depot would join the ranks of Movie Pitchers? Dave, maybe Home Depot, but I think Rouse’s bought their property from Victory back a few months ago. So I imagine they’ll stay put. But who knows? Maybe KamaAina can do some more prognostication.